Relatives attend a funeral service for some of the victims of a collapsed highway bridge, in Genoa's exhibition center Fiera di Genova, Italy, Aug. 18, 2018. Firefighters discovered the three bodies, reported to be those of a couple and their nine-year-old daughter, early Sunday inside a car extracted from the rubble of the viaduct. All those reported missing after Tuesday's collapse have now been accounted for, although rescuers say they will continue combing the wreckage. The announcement followed the discovery Saturday of the body of a man in his 30s in the rubble and the death of another man in hospital. Italy observed a national day of mourning Saturday for the victims of the tragedy. Applause broke out at state funerals in Genoa as rescuers and members of the civil defense department arrived to take part in the service. Authorities used an exhibition center in the area of the Genoa fairgrounds as a church. Large screens were set up outside as Italians from all over the country and tourists turned out to follow the service. Many said they came out of solidarity with relatives of the victims because what happened could have happened to anyone. The archbishop of Genoa, Cardinal Angelo Bagnasco, presided over the solemn service. Italy's top officials and politicians, including head of state Sergio Mattarella and Prime Minister Giuseppe Conte, attended. 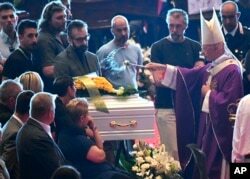 Cardinal Angelo Bagnasco blesses the coffin of nine-year-old Samuel Robbiano during a funeral service for some of the victims of a collapsed highway bridge, in Genoa's exhibition center Fiera di Genova, Italy, Aug. 18, 2018. But not all the families of the victims agreed to take part. Some decided to bury their dead relatives in their towns of origin, while others declined to participate in anger at having lost their loved ones in an accident that may have been caused by poor design or improper maintenance. President Sergio Mattarella, who visited the site of the disaster and the injured in the hospital before attending the service, has defined the bridge collapse as "absurd and frightening," saying the tragedy "struck not only Genoa but the whole nation." The government has set up a commission to investigate the causes of the bridge collapse. The disaster sparked a huge debate in Italy about the state of the country's infrastructure. Autostrade per l'Italia, the company that manages Italy's highway system, held a news conference Saturday in Genoa, maintaining it has always acted responsibly as the operator of the toll road. CEO Giovanni Castellucci said it was premature to respond to the government's plans to revoke the company's concession, but said his company could build a new bridge in eight months.